Ken and Vicky Levene’s 2001 Winnebago Journey hadn’t been on many journeys when they bought it a few years ago. The previous owner used it as a stationary shelter and rarely ever actually drove it. Over the years, the sun and the elements baked the exterior, but the interior remained pristine. 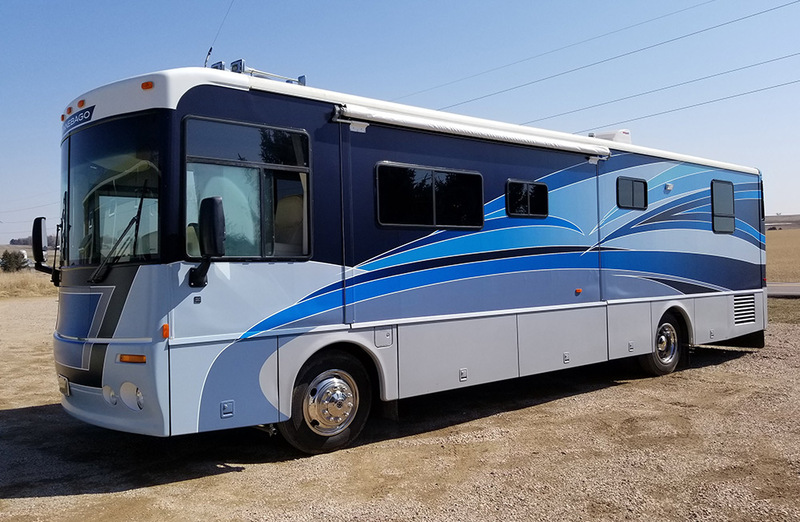 The mileage remained low and the motor remained top-notch – making it an ideal candidate for an RV wrap investment. The Levenes wanted a revitalized look but didn’t want to spend the money for a brand new Winnebago. As they began reviewing their options online, they came across the website for the Sioux Falls-based HS Sign Shop, a subsidiary of HenkinSchultz Creative Services. After a discussion with Partner/Graphic Designer Jason Jellis, Ken knew he’d finally found the solution they had been looking for. 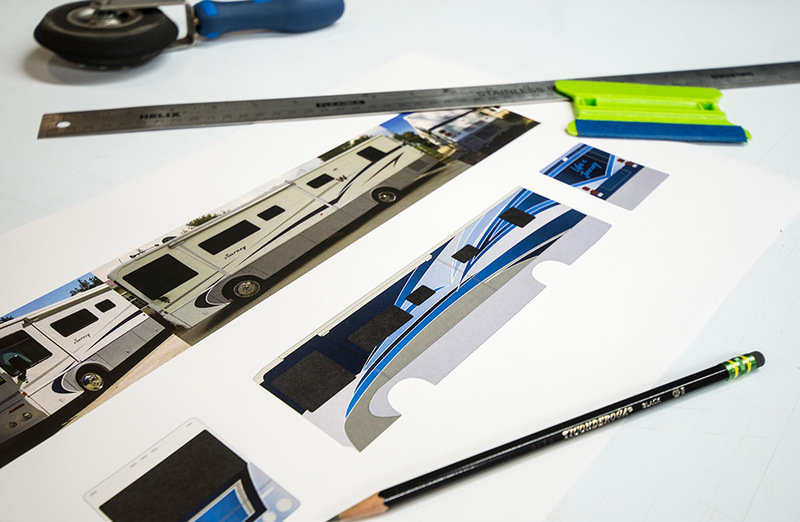 ”Coming up with a unique design for an RV or any vehicle wrap, a customer is only limited by his or her imagination. We also offer countless materials and textures to choose from, including ink-jet printable vinyls – to achieve their vision. 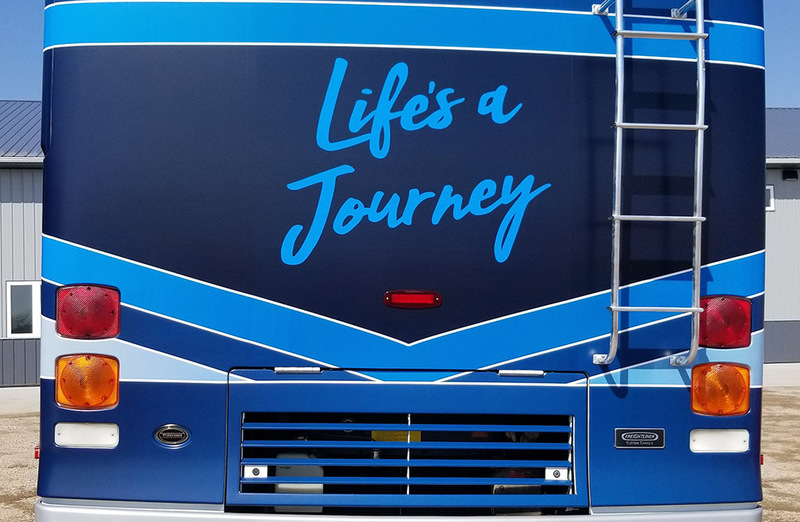 The HS Sign Shop can create a custom design for any RV wrap – making it look as good as new – at a fraction of what new would cost. After the discussion with the Levenes, Jason and the HS Sign Shop graphic design team got to work on developing a custom design. 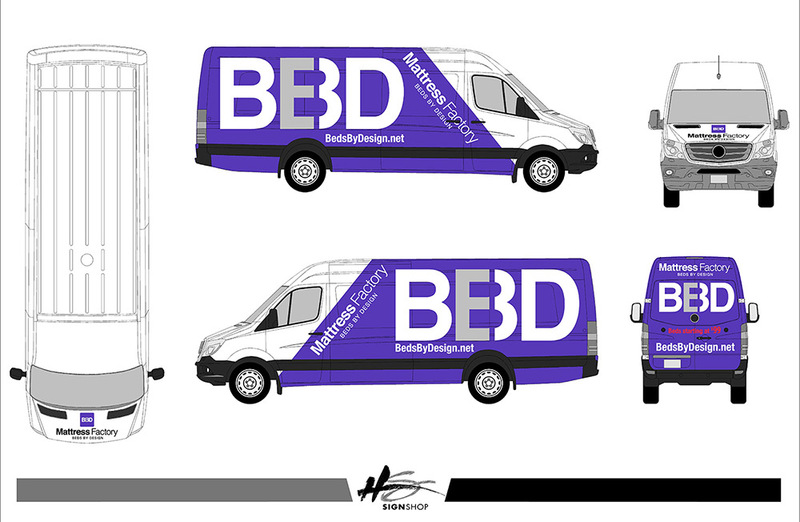 The design they came up with met the exact specifications that Ken and Vicky were looking for, and complimented their existing trailer. 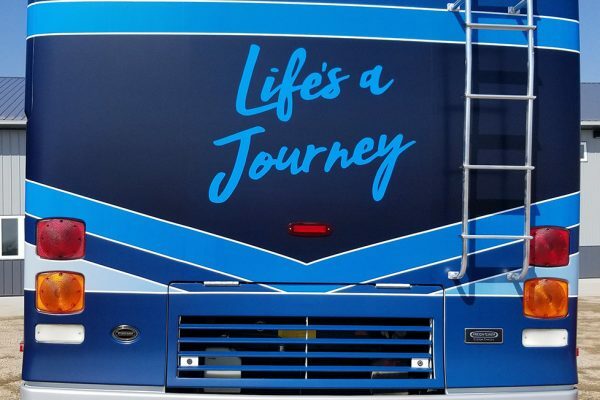 The HS Sign Shop team presented the Levenes with several design options mocked up so they could see how the designs would look when they were on their Winnebago. After Ken and Vicky chose the design they loved, the HS Sign Shop installation team got to work. This 36 foot Winnebago provided a few challenges for the installation team. 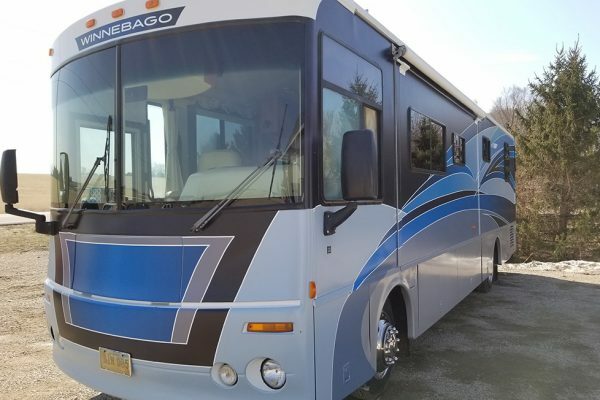 There were unique parts of the RV body to factor in. These included two different awnings and an in-wall slide-out that had to be worked around during the installation process. As the installation process progressed, it was discovered that the windows needed to be resealed with silicone. This was something the HS Sign Shop crew did that was above and beyond the normal install to make sure this RV was completely ready for the elements. “We try to treat every project as if it were our own personal project, and this was no exception,” said Jellis. 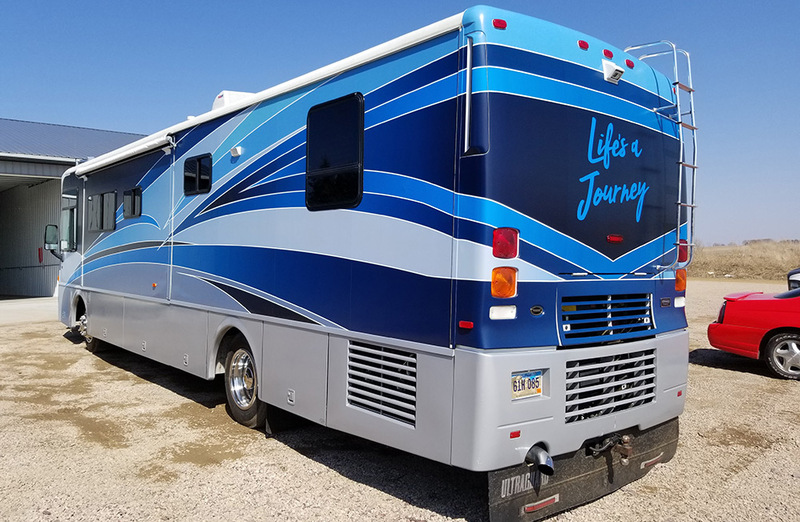 The wrap for this particular RV used a semi-matte finish as opposed to gloss. This created a unique look and worked well to hide imperfections that had accumulated due to weather on the body of the vehicle. The completed wrap took only a few days to finish. When it was done the HS Sign Shop team was excited for Ken and Vicky to get their first look. What they saw knocked their socks off. It looked like a brand new Winnebago! ”The HS Sign Shop makes the customer feel special and that their project is important and they listen to any ideas and concerns. The quality of work was outstanding! With comparable brand new RV’s starting out with a suggested retail price of $204,000, the investment for wrapping an older model Winnebago can be a drop in the bucket, often coming around 5% of what new would cost. 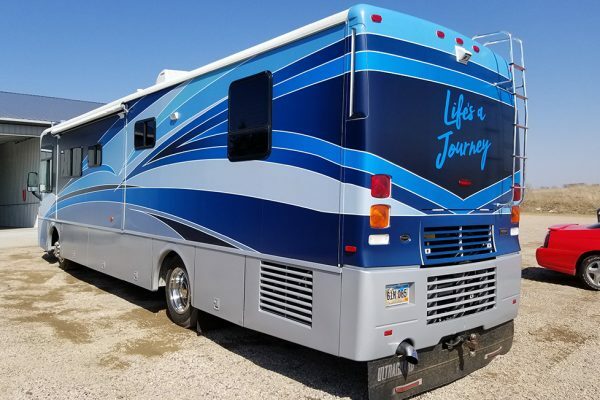 If you’d like to make your RV look new, without having to look at a huge price tag, contact the HS Sign Shop for an estimate on a wrap for your RV. Whether you need a custom design or already have a design ready to go, we’re ready to help your dreams hit the road. We can work with your schedule and get the job done quickly so it doesn’t interfere with your weekend getaways. You can also see more of our vehicle wraps here. Amazing Van Wrap In Under 40 Seconds! At the HS Sign Shop, we move as quickly as we possibly can to finish your projects. In the video below, watch Eric Van Beek as he completes an entire van wrap from start to finish in less than 40 seconds! Obviously we had a little fun shooting the entire van wrap with a time-lapse camera. After condensing the process down, the video really gives you a sense of the attention to detail and excellence in execution that the HS Sign Shop team brings to every project we work on. We always work hard and have fun while we do our jobs, bringing a spirit of playfulness and joy into everything we do. 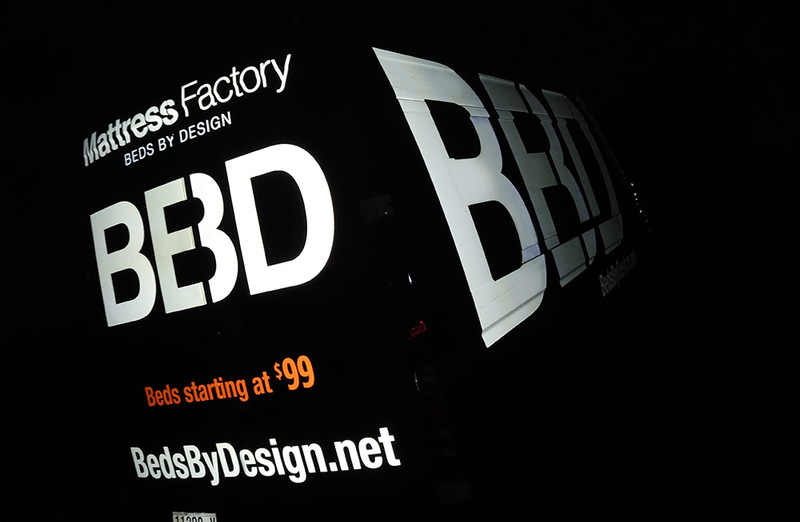 In this particular instance, our client was the mattress factory Beds By Design. 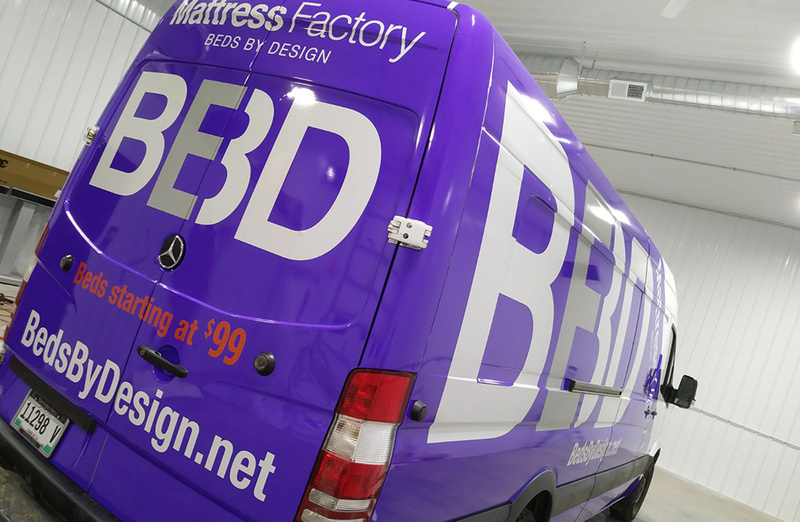 Our graphic design team created this van wrap design for their Mercedes Sprinter from scratch, boldly using the BBD logo and colors to make sure the van stood out while on the road – day or night. 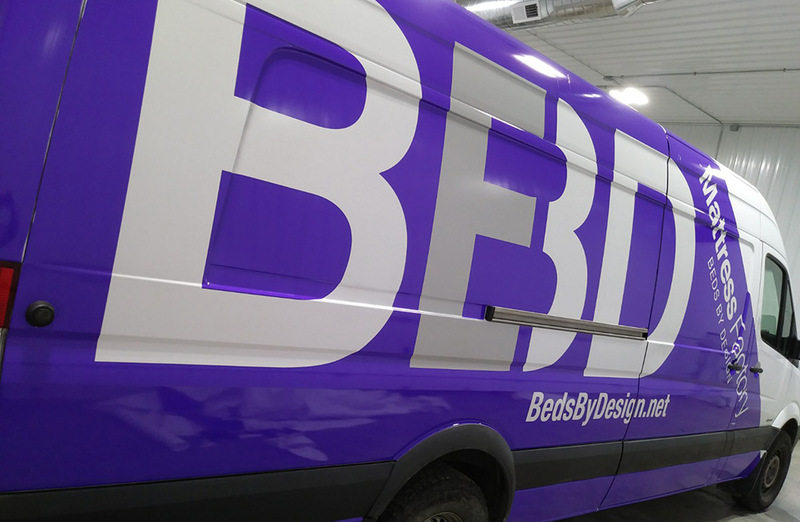 After the BBD team approved the design, it went to our installation team, who prepped the vehicle for the van wrap and began the installation process. 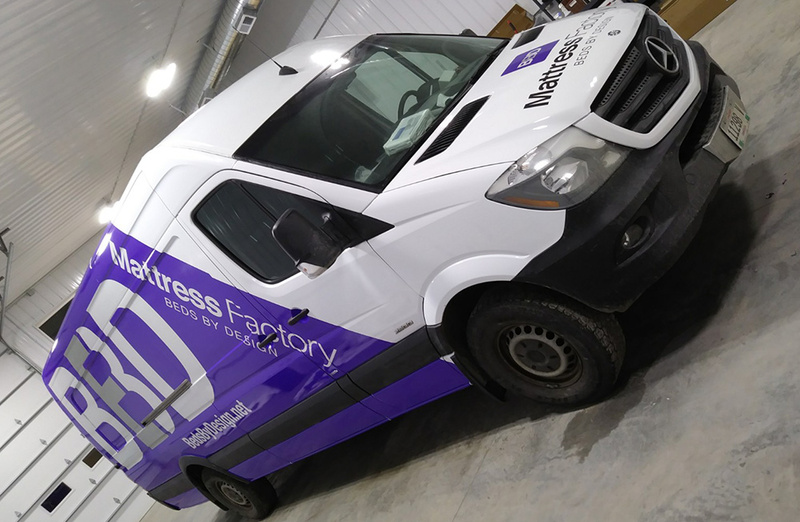 ”This van wrap was a really fun project to work on. Our graphic design team did an excellent job with this, and we all enjoyed seeing how cool the finished product was. The logos and text were done on an inkjet reflective vinyl. This is a very high quality, conformable reflective vinyl from 3M. This material is specifically designed to be visible at night when illuminated by artificial lighting, such as vehicle headlights. 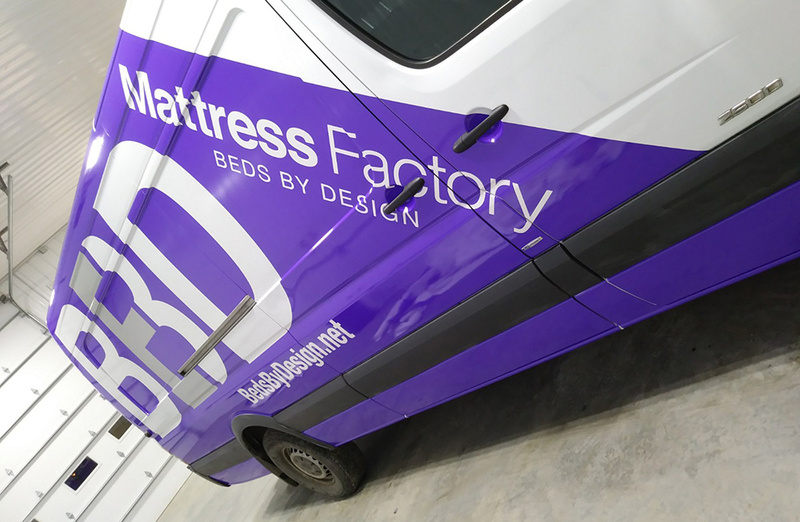 The actual van wrap installation occurred over just two days. There are so many different factors that come into play during installation. Our team has the expertise to make sure the process goes as smoothly and efficiently as possible. So while we may not be able to get it all done in less than a minute, we will get it done as quickly as possible. And the results will amaze you! Contact us today for more information on van wraps, large format graphics and any of your other signage needs.